Note: I could only find the newer presentation style of this talk. Visually it is different from the presentation in the video, but it is the same content. We wear a lot of hats as front-end developers. Depending on the client or company you work for, you may be the designer, UX/UI specialist, site-builder, QA tester, and developer all rolled into one. How can we possibly add the accessibility hat on top of all that? What accessible pieces should we even include? Which pieces are easy wins vs. impossible juggernauts? How do we implement inclusive development when a project does not have a lot of time or budget to include that piece? 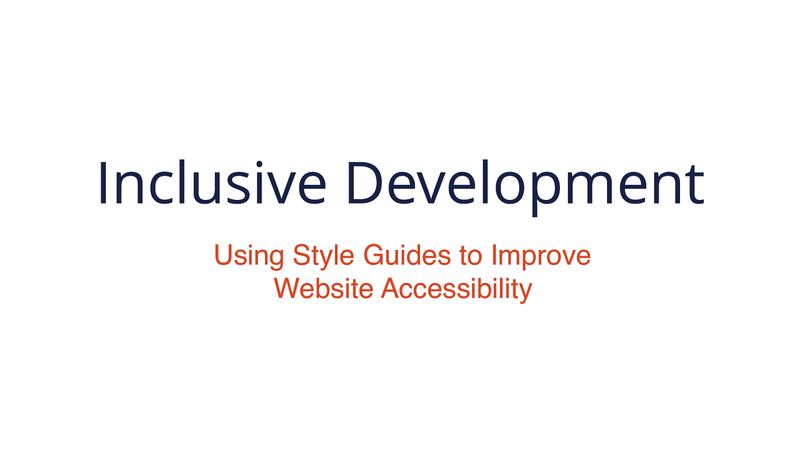 One way we can tackle these issues is by using an accessible component-driven approach. By thinking about inclusiveness from the start, we can get a head start on accessibility while still building the required site components.